Few things can reduce me to a puddle of tears as quickly as a dog story, especially if the canine subject is lost, abused, or sacrificed for the well-being of his owner. Yet for all my sentimentality, I am particular about my dog stories. Too often, authors allow extreme displays of loyalty or mischievousness to stand in for a thoughtful portrayal of the dog’s own personality; the author is so intent on showing the redemptive power of canine ownership that the ostensible subject of the book feels more like a walking metaphor than an actual presence in the narrative. 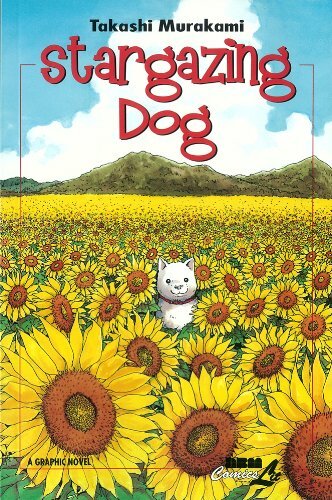 Takashi Murakami largely avoids this trap in Stargazing Dog by granting his canine protagonist a voice. In less capable hands, Happie’s narration might be precious or manipulative, prompting the reader to feel unearned sympathy for him. Murakami, however, finds just the right words for Happie, expressing his point of view with a simplicity and directness that seem appropriate for a dog. 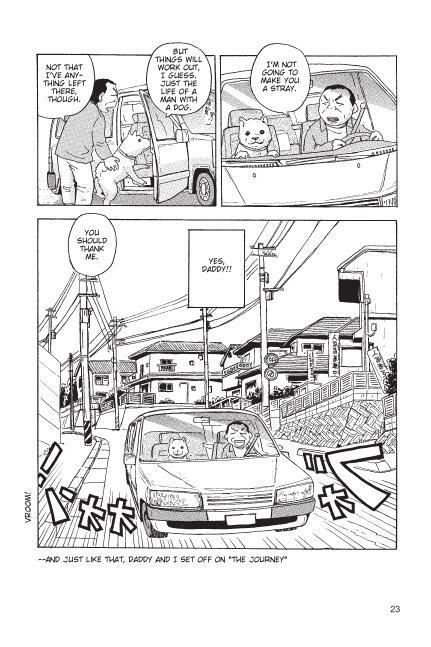 Early in Stargazing Dog, Happie forms a strong attachment to a character identified only as “Daddy,” a father who gradually becomes estranged from his wife and teenage daughter. With the dissolution of his family, Daddy packs Happie and a few possessions in his car, and begins driving towards the sea. The outcome of their journey is never in doubt — we learn Happie and Daddy’s fate in the very opening pages of the book — yet Murakami draws the reader into the story with a nuanced depiction of the master-dog relationship. Daddy and Happie take to the road. The second is communication: though Happie and Daddy clearly share a special emotional connection, there’s a fundamental gap between them that can’t be bridged. Happie never fully grasps what’s happening to him and his master, perceiving the changes in their routine without understanding their cause. Daddy, for his part, never acknowledges the degree to which he views Happie as an extension of himself; as his circumstances deteriorate, he continues to rely on Happie for companionship, putting his own emotional needs before the dog’s. Murakami never romanticizes Happie and Daddy’s relationship, though he honors the sincerity and warmth of their bond. The roughness of the art — the human characters’ clumsy hands and round heads, the crude use of perspective — further inoculates the story against mawkishness, while the exaggerated facial expressions and child-like rendering of space and objects echo the naivete of Happie’s narration. Only a few poorly chosen fonts and backwards signs mar the design, reminding the reader that the artwork has been flipped for English-speaking audiences. Perhaps the best compliment I can pay Murakami is to acknowledge just how much Stargazing Dog moved me. Not in a cheap, dog-in-peril sort of way, but in the same way that Vittorio de Sica’s Umberto D. touched me: as a beautiful meditation on the human-canine bond, one that acknowledges the complexity and inequality of that relationship, as well its enduring power. One of 2011’s best new manga. I’ve been interested in this work for a while, but there’s one important thing I want to know before I see about picking it up: Will it rip my heart out? By which I mean, does the dog die? It seems like every animal book I pick up has the animal die at the end or near the end, and I 1) need to know it’s going to happen in advance so I can prepare myself mentally and 2) I need to make sure I have a sufficient supply of tissues. Hi, LG! Yes, you will need a lot of Kleenex for this one, as the dog dies. I cried while reading it, and got the sniffles while composing my review. That said, I didn’t feel that the story was manipulative; I thought Murakami managed to tell a sad story without being maudlin or excessively sentimental. Definitely worth reading, though I’d pick a day when you’re in the right frame of mind. Privacy is also a good idea—this isn’t a book I’d read in public! When you published this review, I only read this part “Few things can reduce me to a puddle of tears as quickly as a dog story” because since then I wanted to read this volume and doing it knowing the less the possible. If you hadn’t recommended this manga so far, probably I would have never discovered it, so I am grateful to you 🙂 It’s a really nice story (or should I say two stories?) So touching but not cheesy… The mangaka did the perfect combination. I’m amazed that this is his very first manga. Maybe this work will become one of my favorites mangas; I have to wait some days to assume it and then, I’ll decide. Even if I’m not a lot into animals (I prefer plants), I cried a bit. Recently, my family adopted a dog and some scenes in the very first part are similar to the ones I’m experiencing with her by the moment now. I must recognize that one of the things that attracted me to acquire this volume was the cover, so plenty of sunflowers, which are also stargazing ;). I was disappointed by the fact that the volume is flipped (and I appreciated nearly all the time, as some time ago I studied hiragana and katana; it was not really comfortable to see all the words mirrored that way) and later by the rotulation in page 51 (when Daddy show the “rubbish” stuff and mentions everything ’cause the words aren’t in the correct place and translation in page 100 (in the original story, that guy drives with the view of sea at right, but not in the flipped one, in which the sea is in his left side [this doesn’t happen in pages 27-28, where the adaptation is correct]). As you see I’m a really demanding reader, but I only found errors/bad things about the edition, not the manga. Let’s see if French edition is not flipped and I can buy it when I visit France. I’m glad I steered you towards a book you liked, Sara — that’s great to hear! I share your disappointment with the English-language edition. The flipped artwork was a distraction, especially since it wasn’t done as skillfully as some of VIZ and Dark Horse’s early manga from the 1990s. If you do buy the French edition, I’ll love to know how it compared with the English version. I’ll do it, but maybe I won’t buy it this summer but in some years. Maybe never. It deppends on many things and I have other priorities, such as continue ‘Ashita no Joe’ and get more Fumiyo Kôno’s works. If you could, I would like you did a post comparing the flipped rotulation of VIZ and Dark Horse’s early manga from the 1990s to the actual one. It would be quite interesting.